Two things I learned about myself at Jamba Juice, yesterday. 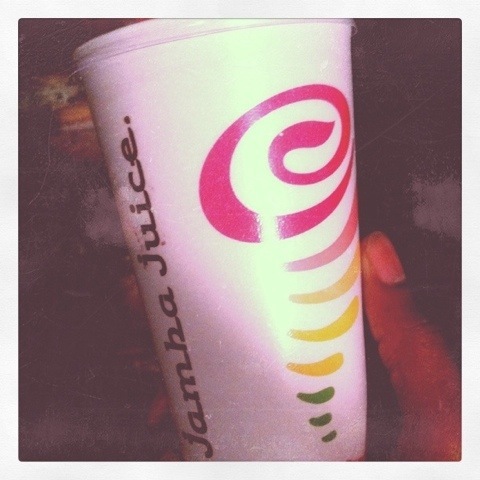 Yesterday I strolled over to Jamba Juice to get a Strawberry Surfrider. I don’t exactly remember what a Strawberry Surfrider consists of, other than lime sorbet, and strawberry something-or-other. Doesn’t really matter. It’s delicious. Anyway, I do my usual bop up to the counter where I’m greeted by a young woman, in a not so sweet but still charming, visor (work is work, do what ya gotta do) who was everything but enthused to be taking smoothie orders. Me: I’m well, thanks. How are you? Let me get an original Strawberry Surfrider. Then it hit me. I didn’t wait to see how she was doing. I asked, but didn’t even pause for the reply. Hmm. That got me thinking about how often I offer salutations, disingenuously. I know it’s a cultural norm to greet people, but how hard is it to allow folks the five second space to express how they are doing. Granted, I just wanted my smoothie, but I bet most of her customers never even bother to ask, let alone wait for a response. And I bet that’s true in almost every service industry. People look at you like the connecting piece between them and the product, an organizational appendage, but not a person who matters enough to know how you’re doing. We only care about what you’re doing. I know some folks will read this and say, Well she clearly had an attitude anyway. And yes, she did. But maybe that’s because no one has bothered to ask her how her day has been going, before ordering her to get cracking on their complicated, overpriced, boosted, blended drink. (What the hell is up with all the booster mess, anyway. I wan’t a smoothie, not a steroid elixir.My smoothie doesn’t need to give me muscles.) Maybe it’s true that a little courtesy goes a long way, and a lot of discourtesy can eat a person inside, out. Lackluster morale can’t be hidden by makeup, and when you’ve been talked at all day, you couldn’t careless about how you’re “coming across.” Maybe she hates Jamba Juice, and it’s hard to find a job out here, so she’s trying to make due, but it was just one of those days. Who knows? A smile. Lesson learned. I have to be more intentional with my words. Even the ones that seem arbitrary and ordinary, have power. That’s the first thing I learned. The second is, I HATE the smell of oranges! Have you guys ever been in Jamba Juice?! It’s rancid with orangey smell. It’s literally like being INSIDE of an orange. Come to think of it, maybe that’s why she was pissed. Yep. And that’s probably why she ran all the words together, like that. Gotta talk quick when you’re holding your breath. ha! J – i’ve always been a fan of making all greetings authentic, sincere, and intentional – otherwise why bother! Little things like that can be the key factor in someone deciding not to end their own lives or the lives of someone else. Even a REAL smile goes a lonnnng way homie. And uhhh oranges? really? sheesh. Jay- Whats up brother! Haven’t talked to you in a minute, wanted to see how you and the family are doing. I hope all is well, and btw your writing (even in this Jamba blog) is awesome. I can actually picture what you are saying. We have come a long way since waiting on the corner @ barnaby manor! Im proud of you there sir!